Are your clients receiving value? The automatic answer from most firms is yes. Here’s the truth of the matter about this assessment. In most cases, the law firm is right. Law firms have an intimate understanding of the value they provide. Research shows the answer is no. According to Lexis-Nexis’ Age of the Client, 40 percent of clients believe the service they receive from their firm is above average. 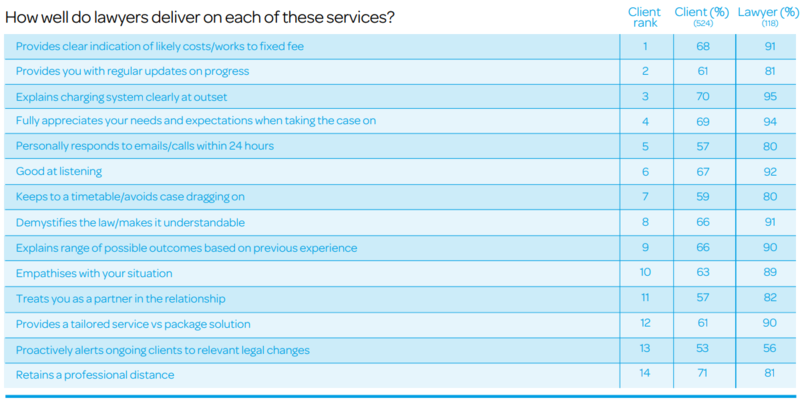 Unfortunately, 80 percent of attorneys believe their service is above average. What firms call exceptional, clients call average? Is the bar set too low? Are firms simply mediocre? Are they focused on doing the absolute bare minimum to serve their clients? For some firms, the unfortunate answer to that question is yes. Read through anonymous posts like this one and you’ll see answers like these. Is this client receiving above average service? Here’s the thing about attorneys. This seems to be the exception rather than the rule. Data shows a large amount of competition, downward pressure on fees and a variety of unpleasant changes means attorneys are more motivated than ever to provide exceptional service to their clients. They want their salaries and firms to grow! Seems like common sense, no? Attorneys are right. In the vast majority of cases, firms are doing exceptional work for their clients. Clients aren’t seeing it that way though. Client priorities are simple and straightforward. There are details that seem obvious when you read them, when in reality they’re actually obscure. Firms know these details are important, they just don’t know how important. There are 14 metrics listed here. Items number one and three are focused on one thing. “Provides clear indication of likely costs/works to fixed fee” and “explains charging system clearly at outset” are two of the most important factors listed here, revolving entirely around money. In fact, this entire list is based on money or attorney/client communication. When it comes to fee arrangements, clients are interested in clarity and flexibility. When they find the right firm, they want to know their team will work with them on the price. The data suggests this flexibility is an unspoken deal breaker for clients. This is why firms need alternative fee arrangements. A recent survey found a change in confidence. Approximately 9 out of 10 attorneys believe they’re operating in a period of unprecedented change. The great recession has produced clients who are demanding, value-driven and cost-conscious. There’s an almost obsessive focus on the value-to-price ratios. A flood of low-cost competitors and alternative fee arrangements flooded the marketplace. This seems disheartening at first glance but it’s actually a wonderful opportunity in disguise. Low-cost competitors struggle to provide/match a significant amount of value that quality firms Their business model isn’t comprehensive enough to meet the demanding needs of today’s client. Without an innovative (and proprietary) process this low-cost model is unsustainable in the long term. As we’ve seen above, clients are using very specific metrics to gauge attorney/firm performance over the long-term. Firms that struggle to deliver compelling value over the long-term continue to lose clients, regardless of their traditional, alternative or low-cost pricing schemes. Price is not enough to retain profitable clients in the long-term. Peter Thiel, PayPal founder and former attorney, created a model firms can follow. This model provides firms with the clarity they need to: (a.) Increase revenues consistently year-over-year (b.) attract and retain profitable, top tier clients. Create X dollars of value for clients. Using the table above, you can structure your firm’s alternative fee arrangements on doing just that. Creating real, quantifiable value for each of your clients. How can AFAs accomplish that?! The vast majority of alternative fee arrangements (and their variations) are based on one of these AFAs. Fee caps: Hourly billings are capped at an agreed upon maximum for a given case, project or service. As you might have guessed, this is hourly billings with a slight modification. This arrangement is definitely more beneficial to clients than it is to your firm. Fixed fee menus: This option provides set pricing on a variety of services provided by the firm. Additional flat fee charges could be added to the initial base price. An investment transaction could be billed at $25,000. Added to that, an additional $8,000 fee for assuming a loan. $10,530 for financing and so on. Fixed fees for single engagements means firms set a hard price on several well-defined services. This isn’t ideal for new services or practice areas and it’s not a great fit for inexperienced attorneys. Firms using this AFA need volume to make this arrangement worth their while. This is perfect for services that produce the lion’s share of a firm’s revenue. Full contingencies: With these no fee unless we win arrangements, survival depends entirely on success. These AFAs are common with plaintiff and defense attorneys. This AFA works best if your firm has a competitive advantage or noted ability in a specific practice area. Avoid this AFA if you’re unsure of the outcome or results you’ll achieve. Holdbacks: A contingency arrangement where a predetermined amount is guaranteed as payment to the firm (say 20 percent). The rest is contingent on the firm’s success in achieving the desired outcome. Receiving fees at 80 percent of your usual rate, with the remaining 20 percent contingent on success. This is often combined with bonus or success fees, further incentivizing firms to deliver results. Partial contingencies/Success fees: Similar to a holdback, the firm receives a portion of their fees during the engagement. They receive an additional lump sum at the end of the engagement if they’re successful. Partial contingencies typically define success criteria ahead of time. These criteria are sometimes left to the client’s discretion or spelled out in significant detail. Portfolio fixed fees provide clients with a single, fixed price for a large number of services. For example, an organization’s intellectual property engagements over the course of a year. With this arrangement, losses are inevitable so you’ll need a significant amount of volume to come out ahead. Retainers: The legal industry’s old faithful. A fee your clients agree to pay every month, for a set period of time, for a specific set of services. These are well known but they’re growing in popularity thanks to the surge in demand for AFAs. Risk collars: An hourly billing arrangement that rewards efficiency. With this hourly billing arrangement, attorneys receive a bonus if their work is completed under budget. Clients receive a discount if the work goes over budget. The actual discounts and bonuses vary from firm to firm but it helps to align the client’s/firm’s interests. Subscriptions: Similar to retainers, subscription plans give clients access to a specific set of services and engagements for a predetermined price. While retainers have a set timeframe and clear purpose, subscriptions are more universal in their application, continuing indefinitely. Subscriptions require a significant degree of experience as you’ll need to be aware of what it costs to provide a particular service. That’s a lot to choose from. We need to answer a more pressing question before we can create value with these alternative fee arrangements. The question is an obvious one. Which practice areas can benefit most from alternative fee arrangements? Every practice area can benefit from alternative fee arrangements. At first glance, this sounds unrealistic. Certain practice areas seem to be tailor-made for specific fee arrangements. Several practice areas seem to be exclusively oriented towards hourly billings. Am I suggesting that every practice area must have infinite flexibility? Instead, I’m recommending that your firm use alternative fee arrangements as a tool to align client interests with your own. Here are a few examples to show you what I mean. Example #1: A client retains your firm to initiate litigation against former executives, directors and officers for fraud. Your client agrees to pay all expenses and costs associated with said litigation. 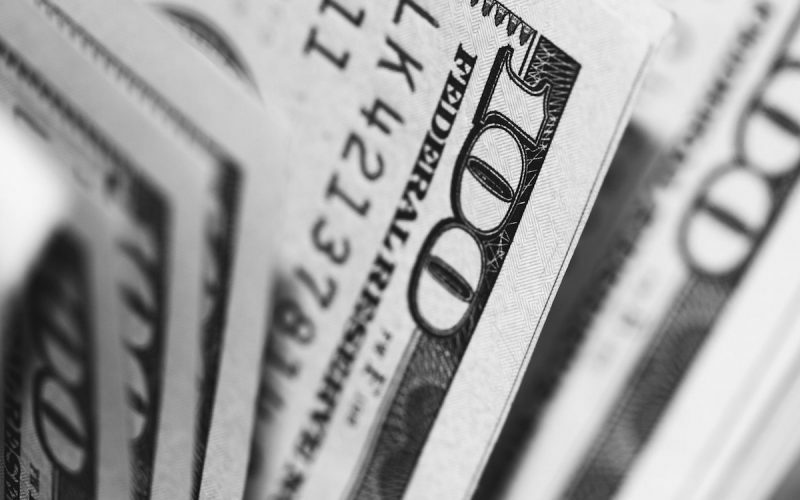 Your firm receives full reimbursement on a “first dollar out” basis as well as a percentage of recoveries from litigation. Example #2: Another client retains your firm to handle litigation and a complex legal matter. They agree to pay your firm a premium but ask that you “hold back” 30 to 40 percent of the agreed-upon fees; your client agrees to pay this holdback (plus multiples) provided that the outcome meets a previously agreed-upon standard. Example #3: A development client retains your firm to pursue arbitration against a joint venture partner. The project is worth $175 million. You and your client come to an agreement where they will pay 50 percent of your rate plus a percentage of the value received once the development project is sold or liquidated. In each of these examples, the alternative fee arrangement is used to align both parties in the attorney/client relationship. The AFA is used to (a.) Provide a win/win situation (e.g. value/profit) for both parties (b.) Create motivators that disincentivize manipulative, predatory or dishonest behavior (e.g. ring the meter). Though clients are often unwilling to admit it, AFAs are about one thing and one thing only. How do we know? They tell us. Here’s a direct quote from clients in the research I’ve shared above. Historically, clients felt they weren’t in control. The attorney/client relationship felt as if they were writing a blank check. Their firm gave them a vague description, they outlined their hourly rate and the process. Today firms are challenged by a new generation of clients who demand alternative fee arrangements. A greater degree of control gives these clients the power they need to protect their interests. This is very good news for law firms. But only if you approach AFAs the right way. When it comes to AFAs, there are only two ways to approach the problem. Proactive firms initiate the AFA conversation with their clients, discussing pricing, budgets and expectations. Reactive firms wait for clients to initiate the conversation. An Altman Weil survey compared these two approaches. Here’s what they found. Why aren’t more firms taking a proactive approach to alternative fee arrangements? The greatest obstacles listed weren’t technical (e.g. skills or software), they were cultural and political (e.g. resistance from partners). The fear is obvious – these AFA’s won’t be profitable. Some firms try, and fail, to make these alternative fee arrangements work. The fault lies elsewhere. In the vast majority of these cases, fee arrangements weren’t given the proper attention and preparation. The obvious and hidden risks are ignored. Here’s how you can make these alternative fee arrangements work for your firm. Collect performance and financial data: Make a detailed assessment of the practice areas under consideration. Create a list of all the tasks, routines, systems and procedures involve and handling matters in this practice area/group. Next, identify the costs involved for each of these items. Outline the costs for billable and non-billable work. Outline the average expenses and costs for each area and various employee levels (e.g. paralegal, first-year/junior associate, senior associate, partner). Create optimization and improvement protocols: You’ll need to develop systematic and repeatable methods for producing, managing and maintaining the work that’s performed. Your goal is simple. Work to consistently (a.) produce high-quality work that’s (well) above average and (b.) Create innovative strategies and protocols to reduce the cost of the work produced (while still maintaining quality standards). First, take the time to consistently collect performance and financial data (a little at a time), and opportunities for improvement will present themselves regularly. 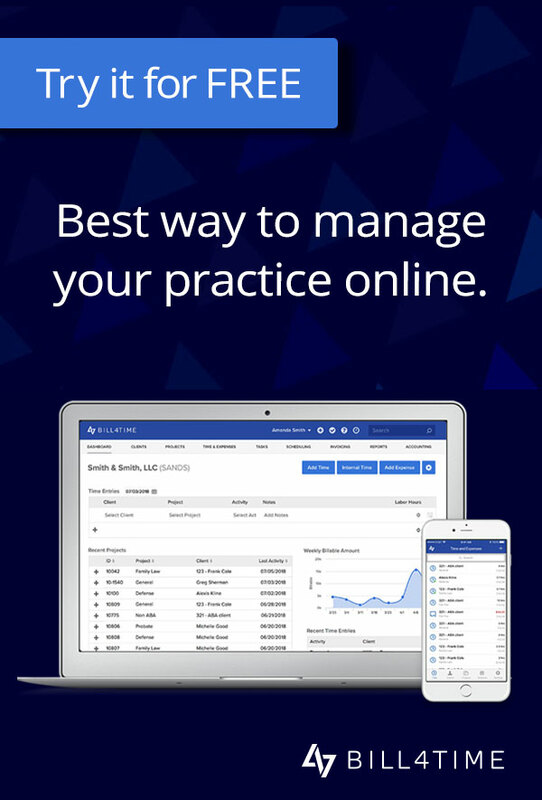 If you’re using practice management software, data collection can be automated or semi-automated. Then take some time to think about how you’d solve the problems presented in each report. Reach out to trustworthy advisors, chat with your mentors. Seek out help on an as-needed basis. Initiate conversations with clients regarding your AFAs. Work with them to create a solution that aligns both of you on the same page. Use the Cobb Value Curve in your practice area to: (1.) Create a massive amount of value for your clients (2.) Create pricing indifference (clients are consistently willing to pay what you ask). 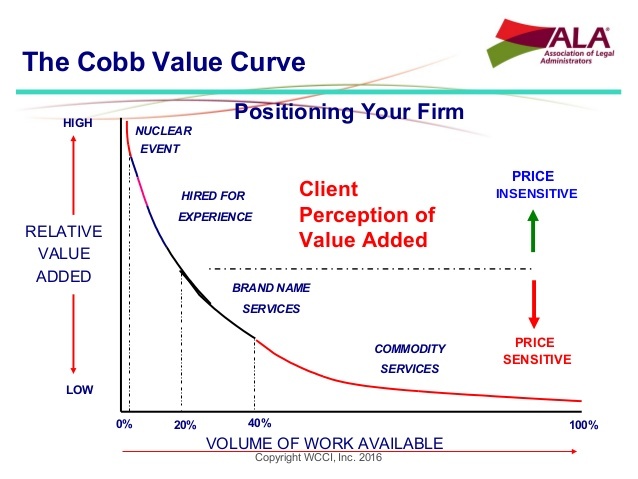 William Cobb, creator of the Cobb Value Curve, explains it in detail. Using AFAs to create an ideal solution requires one thing. You need enough time to work on your business rather than in your business. If you’re buried under client work and your obligations to the firm, you’re working in your business. If you’re using AFAs to solve your client’s problems and align your interests you’re working on your business. Use AFAs to create X dollars of value for your firm and your clients. Take a proactive approach to your client’s financial concerns, study your practice areas, then implement the changes gleaned from your learning. You have the ability to produce a massive amount of revenue and profit for your firm. You have the chance to strengthen client relationships, to maximize the amount clients spend with you while reducing your overall expense. The AFA isn’t a cure-all. Clients are still looking for the same things they’ve always wanted. Your fee is the beginning. It’s the first big hurdle of the attorney/client relationship. Your alternative fee arrangement can align both parties in the relationship. With your AFAs you can offer clients a win/win situation and create motivators that disincentivize win/lose behavior. You and I know the truth. If you made it this far, you’re already exceptional. Most attorneys do amazing work for their clients, clients aren’t seeing things the same way. Most likely not. Most firms know they produce exceptional value. They have an intimate understanding of the value they provide. This isn’t the exception, it’s the rule. As we’ve seen, competition, downward pressure on fees and commoditization motivates most firms to deliver tremendous value. Most clients aren’t seeing it. They’re using a different standard to rate their firms. Their priorities are easy, simple and straightforward. Use their rating system to teach clients about the value you’re already providing. Combine your learning with the Thiel formula and the Cobb Value Curve to create an AFA that maximizes value and profit for both parties. Do this and you’ll find clients believe you’re the exceptional firm they’ll do anything to keep, value assured.